Makeover Monday: How Safe Are You at Your Local Fairground? Over the next two weeks of Makeover Monday, we’ll be taking a look back at visualisation that Andy and I did in the past that we would do differently today. One of the most fun aspects of this is it helps us see how far we’ve come in our development, and it also helps the community see that we’re not perfect. We make lots of mistakes and have done poor vizzes in the past. 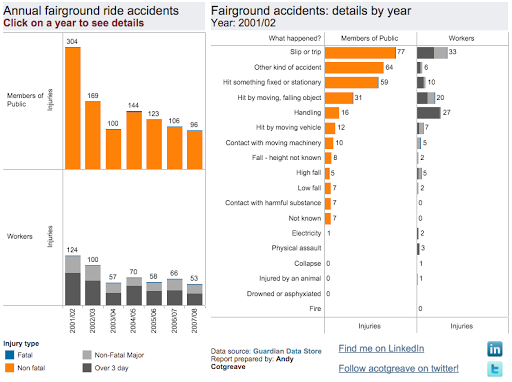 This week we look back at this viz Andy created in 2010 about fairground injuries. Click on the viz to interact with the original. Last week at the Data School, we watched Andy Cotgreave’s talk entitled "How Data Storytelling Can Enhance the Way You Communicate?” and in this session Andy talked about vertical vs. horizontal visualisations as a method of storytelling. I’m doing my best to use Makeover Monday to help me develop my design and storytelling skills, so this week I wanted to created a vertical story.